Look at the body. I work out! I worked out at 7 this morning, as I didn’t have to take Luke to Doggie Village as he’ll be spending the weekend with his grandparents. And their 3, count them, 3 dogs. Before I talk about my favorite subject (me! ), a shout out to Emily who completed unassisted pull-ups for the entire WOD! It’s awesome as a coach to see someone who has not only the competence but the commitment to succeed. I like de-load week. Reps @ 85, 95, & 100#. Uhm, I’m confident that my true 1RM is greater than 145#. Damn bad day when attempting 1RM. Each round will begin with front squats, i.e., don’t start a new round where you left off. You may not complete a full squat clean for first front squat rep; thus power clean the bar to your shoulders and then complete a front squat. After completing last front squat rep, press, push-press, or push-jerk the bar overhead and rest on shoulders behind neck. After completing last back squat rep, press, push-press, or push-jerk the bar overhead, bring to front of shoulders, mid-thigh, and to the floor. You may not drop the bar behind you. Just 100, 95, & 85#? I decided instead to complete lifts based either upon 80, 75, & 65# of push-jerk 1RM or 70, 65, & 60% of what my push-jerk 1RM should be. You decide. I care naught. 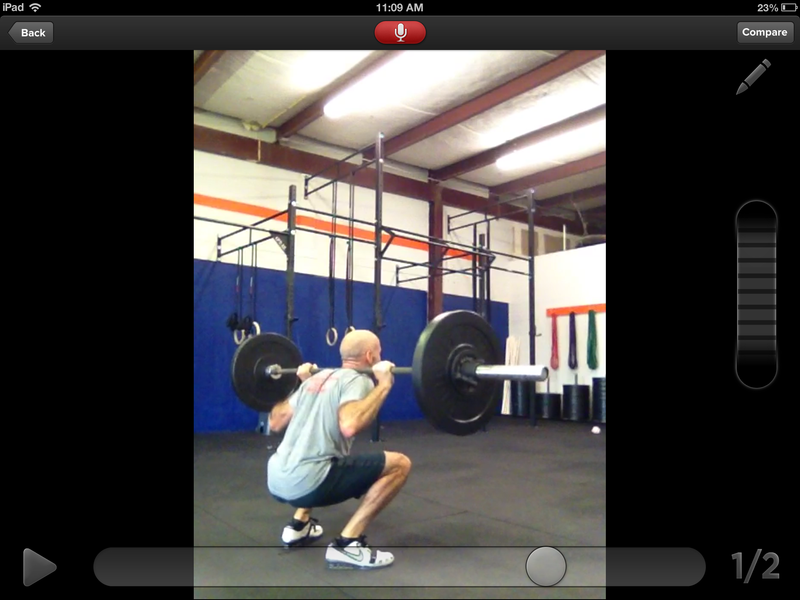 I completed squats @ 115, 107.5, & 100#. My goals were to complete all rounds unbroken, i.e., FS, BS, & pull-ups, and to not move placement of hands on barbell, i.e., not spread hands wide for back squats. I am pleased with the consistency of my pacing throughout the workout. Yup, I recorded and reviewed (in s l o o o o o w motion) to ensure that form was good. It was. I’ll gladly show you the recording. I also followed all of the requirements. Uhm, that’s a given.